More and more homeowners choose houses in part for their open layouts, such as kitchens that flow directly into living rooms instead of being separated by a wall. If your current kitchen design falls into the “closed off” category, and you want to spend your remodeling budget elsewhere, don’t fret. There are many simple and inexpensive ways to make a closed kitchen seem larger than it is. How Can I Make My Closed Kitchen Design Seem Bigger? Replace your cabinet doors or your entire cabinetry system with glass. The ability to see into the cabinets makes any kitchen design appear larger than it is while also helping you remember what is where so you don’t find expired dry goods lodged in the back. 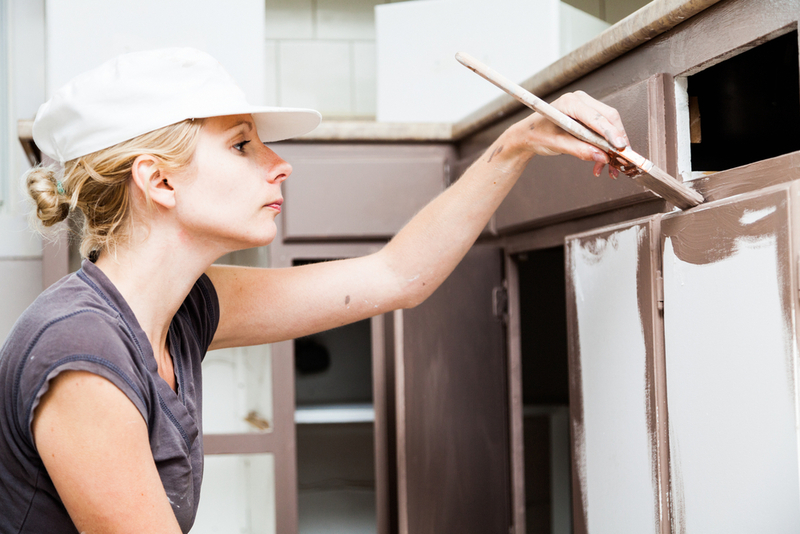 Use light-colored paint such as a pastel yellow or neutral beige hue to open up your closed kitchen. Dark colors make any small space seem even more claustrophobic. Pair your chosen paint with light-hued, complementary window treatments that allow as much sunlight in as possible for an airer kitchen. Save complex design ideas for the rest of your house and use decor pieces sparingly in your kitchen. Busy backsplashes and an abundance of wall decor create a cluttered, small feeling, so choose a few key pieces that again complement your color scheme. As far as your backsplash goes, choose uniform subway tile or another light-colored option. Opt for small yet comfortable kitchen furniture featuring clean lines and not a lot of detail. Bulky furniture with thick legs and dizzying patterns contribute to a cluttered look and take up too much floor space. Replace dated, inefficient appliances with reflective versions to add even more light to your kitchen design. Stainless steel refrigerators and stovetops offer a modern, sleek look while reflecting natural and artificial light perfectly. Revamp your kitchen design with assistance from Broadway Kitchens & Baths, the remodeling company proudly serving Manhattan, NY and Englewood, NJ, for over 20 years. Enjoy customizing your kitchen and bathroom to your exact specifications with these talented designers and fully licensed and insured installation team. Call (212) 260-7768 today to schedule a consultation or visit the company online for service details. Get the latest design news on Facebook.